The first half of 2015 has passed and we can make the first valid conclusions on trends, which describe the main aspects of Bitcoin eco-system. Despite the fact since the start of the year Bitcoin price lost around 14%, we can see in general absolutely positive trend on the appreciation of cryptocurrency role and significance in business community, among regular customers and, which is the most important, in the sphere of payment innovations. While since the start of the year the rate decrease by 14%, within two last years the growth made around 220%. Lately we can see the price stabilization, which occurred right after the bubble of 2013. Let us remind you during the year 2013, bitcoin rate increased by 50 times. At the same time, launch of large exchange and processing services in the USA, including Coinbase, which created well-developed and reliable infrastructure for getting and storing bitcoins, have attracted enough number of institutional investors to the market, which led to volatility decrease. The number of the cryptocurrency users is growing and the number of e-wallets is now estimated to be around 5-10 mln., the number of active users is close to 2.4 mln. Coinbase counts around 3.1 wallets. 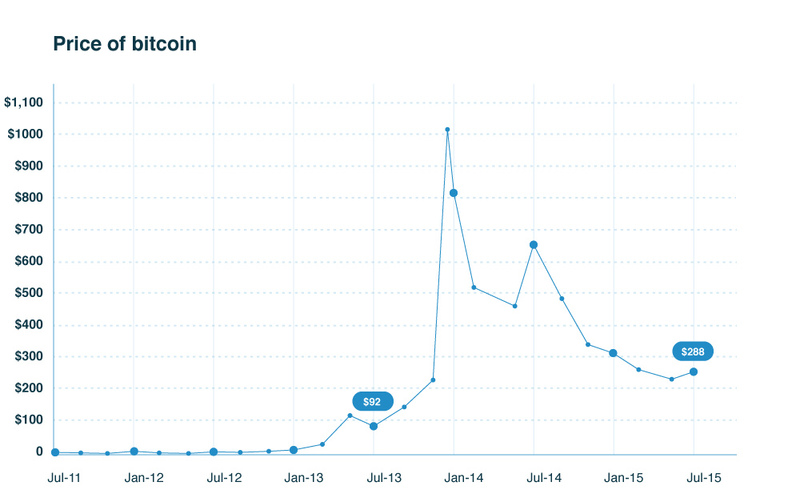 The number of daily transactions in bitcoin-network is growing smoothly. 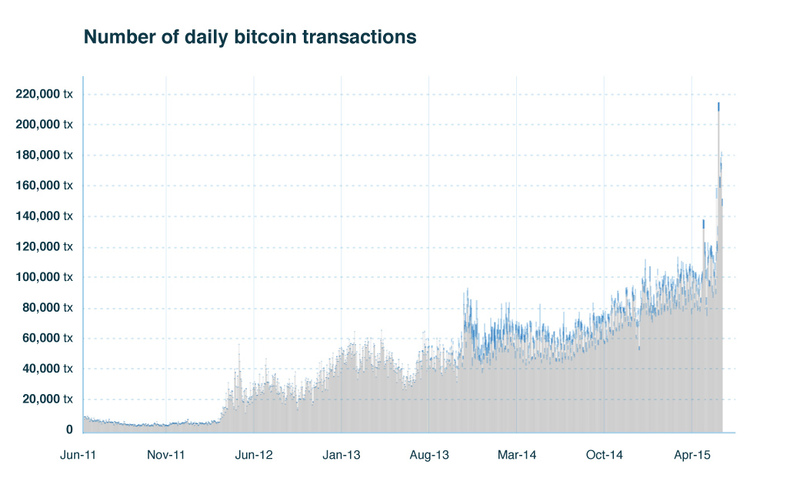 Average daily number of transactions in June 2014 made around 60690, in June 2014 the amount increased to 117474. As we can see the transactions increased within a year by 94%. The global character of Bitcoin is one of its main advantages, CoinBase customer base expands at the sake of the clients outside the USA. The service now supports wallet management in more than 190 countries, functions allowing to buy and sell cryptocurrencies in 25 countries, interface is available on nine languages. As of today 47% of the wallet owners are located outside US. The biggest wallet number growth dynamics in 2015 has been shown in Hong Kong, Tanzania, the Philippines, Romania and Algeria. At that, we may observe increasing the number of clients not just at the expense of demographic factor, the age one affects the situation either. 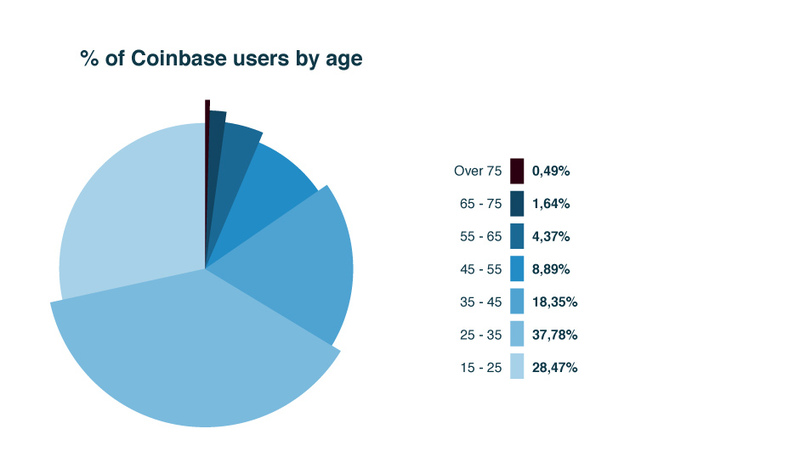 It is not a secret, the majority of Bitcoin users consists of technically educated young people. We may observe the growth of clients above the age of 35, their number is now close to 34%. The number of developers within Bitcoin ecosystem increased in the first half of 2015 accordingly. Currently there are around 7000 applications made by developers for the cryptocurrency infrastructure. Some applications are enjoying wide popularity among customers, such as ChangeTip, Lawnmower and Zapchain. In addition to the applications, used by Coinbase users we see a series of promising bitcoin start-ups recently launched public or closed beta-versions of products. The following companies 21, Abra, Blockstream, Streamium and Augur are among them. This year Bitcoin has been added to the list of payment systems and tools by many of the most progressive payment providers, such as Stripe and Braintree, lots of leading developers have also initiated the process of work with the Bitcoin code. 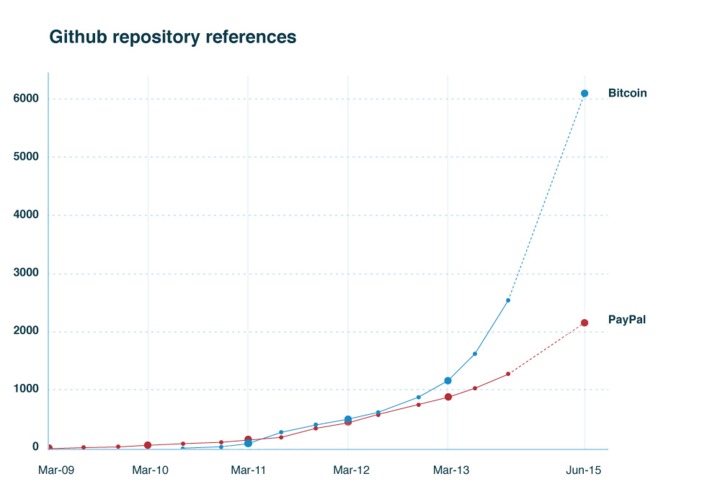 As of June 30 Github counted 6109 repositaries, which refer to Bitcoin. For comparison, this number for PayPal makes 2318 repositaries. What is expected in the second half of 2015 and further? Despite the volatility of the bitcoin market value on a short-term horizon we think on a long-term horizon the bitcoin prospects look positive. Global world shocks, like the situation wit Greece show lots of draw-backs in closed banking systems. The questions on providing security and transparency of bank transactions step forward. These problems particularly will let bitcoin prevail. Cryptocurrencies is a global, safe and universal tool for the world financial system. At the same time let's not forget about talented developers, who will keep on creating new decentralized payment gateways based on bitcoin technology. Once again that will let digital currencies be in focus of innovation trends.